Fluoride Removal from Water Using Adsorption Technique (M.S. Onyango, Hitoki Matsuda). Water Defluoridation Processes: a Review - Application on Nanofiltration for Future Large Scale Pilot Plants (M. Pontié). Calixpyrrole-Fluoride Interactions: from Fundamental Research to Applications in the Environmental Field (A.F. Danil de Namor, I. Abbas). Fluorine-Containing Agrochemicals. An Overview of Recent Developments (Georges Theodoridis). Fluorine: Friend or Foe? A Green Chemist’s Perspective (S.J. Tavener, J.H. Clark). Emerging "Greener" Synthetic Routes to Hydrofluorocarbons: Metal Fluoride Mediated Oxyfluorination (M. Subramanian, T.G. Calvarese). Fluorine Analysis by Ion Beam Techniques for Dating Applications (M. Döbeli et al.). 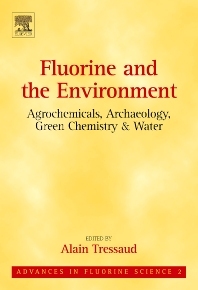 Fluorine and Its Relevance for Archaeological Studies (I. Reiche). Advances in Fluorine Science is a new book series presenting critical multidisciplinary overviews on areas in which fluorine and fluoride compounds have a decisive impact. The individual volumes of Advances in Fluorine Science are thematic, addressing comprehensively both the science and applications on topics including the Environment, Green chemistry, Medicine, Health & Life Sciences, New Technologies & Materials Science, Energy and the Earth Sciences. In the present volume, the key-position of fluoro-products in agriculture is reviewed, since a large percentage of agro-chemicals and pesticides contain at least one fluorine atom. However, improvements in the use of fluorine-based products in agrochemicals cannot be developed without taking into consideration a safer environment, on both levels of greener synthesis routes and a reduction of the negative impact on plants and organisms. Within this scope, fluorine has a very peculiar place, since its high reactivity yields several advantages, for instance in by-passing various polluting multi-step reactions. Fluorine-based materials are reviewed as efficient tools for protecting our cultural heritage. Also using up-to-date techniques such as ion beam analysis, this element can help relative dating applications, ranging from burial durations of archaeological bones and teeth to the determination of exposure ages of meteorites on the Antarctic ice shield.